Crockpots are quite magical. I’m tellin’ ya, they’re the stuff of dreams. It’s really a fantastical concept. You put a cup of this and a teaspoon of that into the bowl and within a few hours, it miraculously turns into dinner. Lazy people unite! I gotta be honest. Between serving, babysitting, sampling, recipe developing, blogging, nutrition counseling, doing homework, writing my thesis and going to class, I don’t have the time nor the patience to stand over the stove cooking lentils. I mean I barely have the patience to do my hair. So I don’t. I bet if you put a broomstick and some feta in there it would transform into the best damn gyro you’ve ever laid mouth on. If I let my [empty] wallet stew in there with a flaky croissant, would I be teleported to Paris? If I stir together a couple pairs of stinky socks and my yoga pants, will I wake up with bulging biceps? Maybe if I soak my thesis proposal in organic vegetable broth and let it simmer overnight I’ll wake up to my diploma glued to my forehead. Dreams aside, I know one thing for sure. If you dump some lentils, quinoa, veggies and curry paste in that bad boy, out comes a delish dinner that required next to no effort. Haaaaayyyy all my lazy party peeeoopppllleee!! But I mean, it’s no Paris. A super easy and comforting one-pot-meal loaded with lentils, quinoa and veggies. Add all ingredients to a 5 qt. crockpot. Stir to combine. Cook on low for 7-8 hours, or until lentils are tender. For more crockpot comfort, try my Super Easy Chickpea, Broccoli and Brown Rice Crockpot Casserole. You WON’T be sorry. The crock pot rules!!! And, since you’re so crazy busy, I’m sure it helps out a whole lot instead of slaving away in the kitchen. It’s the best time saver ever! Annnnd even though it’s almost 9:30 at night here, I’m now currently craving a big bowl of this curry with a side of crusty bread! Oh dear…now my tummy is rumbling! Sigh! Oh dear….me too!! And that crusty bread? OMGGGG! I’m pretty much always hungry before bed. It’s such a pain! Wow – this is one heck of a smorgasbord of goodness! Awesome job on this curry! I just want to move into a crock-pot and then come out when it’s time for retirement. It does all the work for you, it’s like the ultimate life hack! Loving this recipe and clearly I’ve been on a slow-cooker kick so consider it pinned! SUCH a life hack. I too would like to chill in my crockpot until it’s time for retirement. Maybe we can both squeeze in their together. Dudeeee that sounds SO delish… sadly, I’m crockpot-less! Maybe I’ll try making a stovetop version! How long do you think I’d have to simmer it for? Wahhhhh I feel ya! You could definitely make this on the stove. I would bring it all to a boil and then simmer it (covered) until the lentils and veggies are tender! Hope it works out! Got it, thanks! I love that recipes like this aren’t particular about what order you put stuff in/how long each thing has to cook before you add the next… Will definitely be trying this! Oh the crock pot is definitely my friend, too. The key for me is finding recipes Meghan will eat because she doesn’t like soups, stews, or basically any food that’s mixed together. Ugh. This recipe looks incredible though! I love a good curry. Yum! 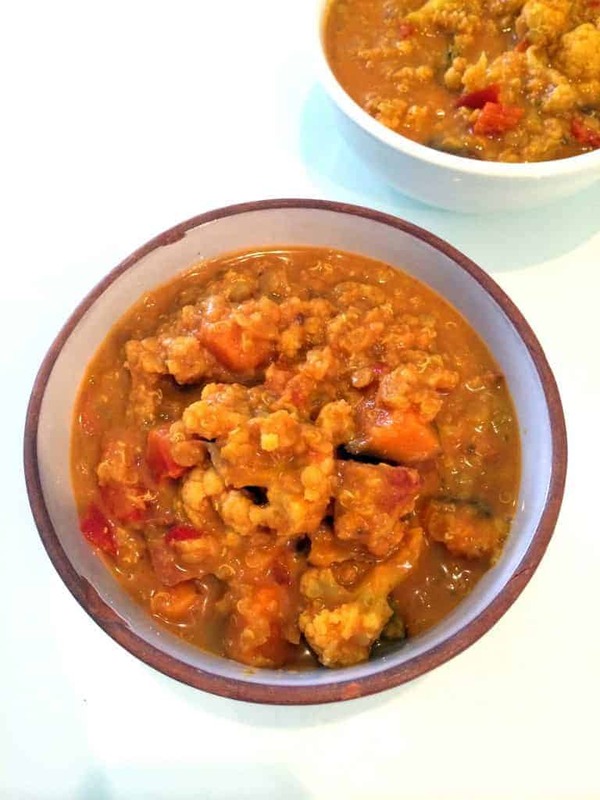 I’ve had a red lentil curry recipe brewing in my head for some time now too. I have a feeling I’ll be turning my crockpot on Monday morning! :) Happy Friday, Alexis! Aren’t they the best?? Especially with this freezing cold weather! crockpot is a life saver esp on weekdays! This looks fantastic! And I agree about crockpot meals – they’re really the best way to go. This does look majorly delicious especially with the coconut milk and the (Thai Kitchen?) red curry paste. I’ve gone all these years without a slow cooker but I do use my rice cooker all the time and it can do some of these types of recipes, I need to explore that more. Wish yours did work on your thesis, wouldn’t that be handy? I actually used lite coconut milk from Trader Joe’s because you can’t be the 99 cents per can! I got a 3 qt. crock-pot for Christmas and I LOVE IT. I’ve only used it 3 times now but it makes food prep so much easier/less time consuming. I’ll have to try this recipe….having a hard time finding good vegetarian recipes that aren’t some version of chilis haha Also saw your pic in the Student Scoop. Congrats on your scholarship! Yayyy for crockpots! What’s the Student Scoop? I’ve never heard of it but I’d love to see the article you’re talking about! It’s in the January 2014 issue. If the link doesn’t work try searching their website (although their website search system is absolutely horrible). Hope you can see it! Oh I love easy crockpot recipes like this – they save me during busy weeks! And I am allllll about lentils right now – so I definitely have to give this a try! Looks awesome! Hi Alexis! If I only have green lentils will this recipe be a disaster?? I just picked up my very first crockpot and this is the first dish I’m going to try with it! So excited. Would it be possible to cook it at medium for less time? If low is best, I can wait for a day when I’ll be home with ingredients and able to prepare it ~7.5 hours ahead . .
Hi Alexis…..Just finished prepping and “dumping” into my crockpot and can’t wait to see the results! I’ve been craving a curry lately, so really excited to try your recipe. I sort of fudged and added some extra veggies and fresh turmeric in there….thinking I may add some fresh spinach or kale near the end to add some greens to the mix! Now, I just have to wait 6 hours!!!!!! and YES the crockpot is a Lifesaver for me too!!!!!! HI Alexis – I want to try this. I am a fan of two of your crockpot recipes so far. 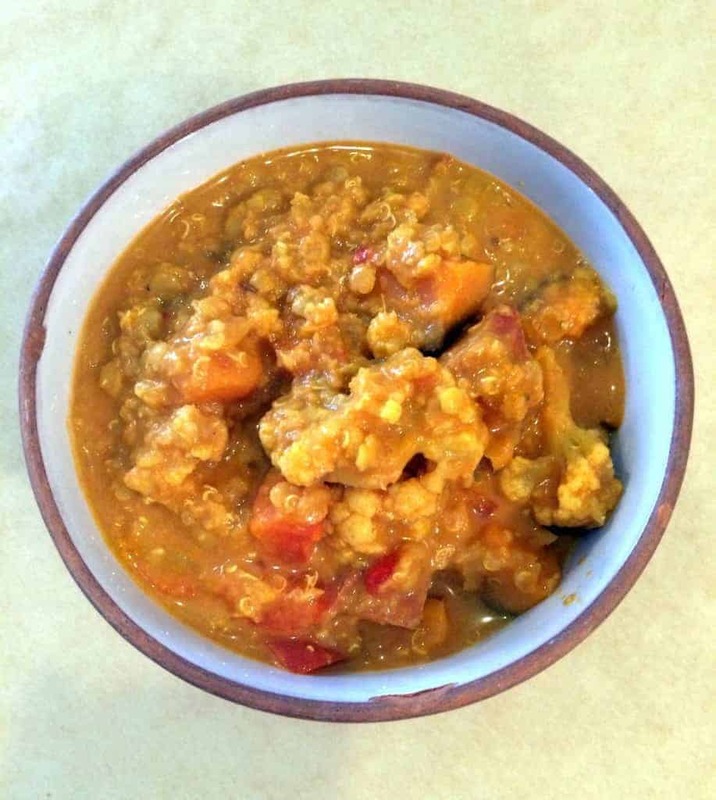 Are the red lentils cooked? I assume sweet potato diced.